LeBron James is widely considered the best basketball player on planet earth and has been for quite some time now. He’s taken his team to the NBA Finals for six consecutive seasons and has his Cleveland Cavaliers atop the Eastern Conference standings once again. With all that being said, James has not been named the league’s Most Valuable Player since the 2013 season, for reasons many basketball fans cannot understand. Richard Jefferson, on the other hand, does understand and laid out the reasons why alongside Cavs broadcaster, Fred McLeod. 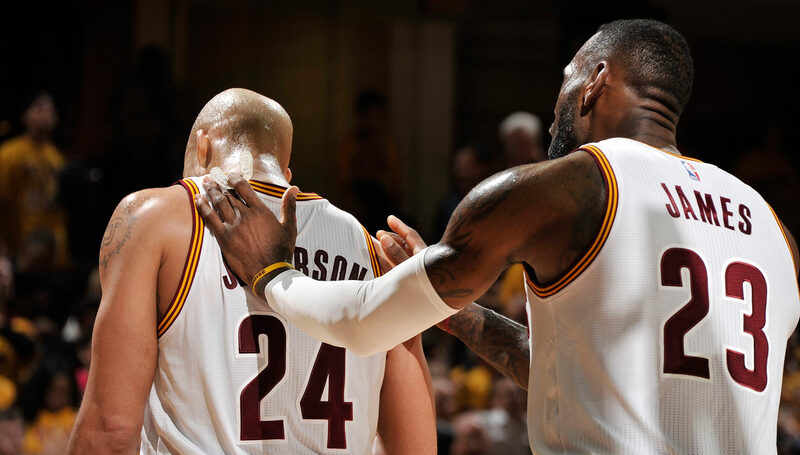 “It’s so funny when they keep talking about all these MVPs, and who’s the MVP, and you know, ‘Kawhi’s the MVP’, but then they go ‘Oh, but LeBron’s the best player on the planet’,” Jefferson said after Thursday night’s tide-turning victory. RJ would go on to say that LeBron’s personal accolades have been affected by the fact he’s the league’s model of consistency. James is averaging 26 points, 8.9 assists, and 8.4 rebounds while shooting 54.2% from the field and 38.5% from behind the three-point arc. Then add on the fact that the 32-year-old is playing 37.5 minutes per game. Yet the King finds himself at three or four in the MVP conversation. “LeBron does so much and sometimes you’re just like, ‘But we’ve seen this from LeBron; we haven’t seen this from (Russell) Westbrook’,” Jefferson said. “…You get complacent with excellence, and they’ve seen it so long, they’ve seen him make everyone around him better, they’ve seen him go to the Finals six straight years … LeBron is the beacon of consistency, and it’s like, (do we need) nobody to have a great year in order to look at his numbers — 25, 8 and 8, shooting 50 percent, 40 percent from three? “People have nothing else to talk about so they make stuff up,” RJ finished up. James has carried this Cavalier team so far this season, with the absences of J.R. Smith, Kevin Love, and others at different times of the year. On Thursday night, the Cavaliers were energized by the return of Kevin Love but still saw James put on a clinic. With Kevin Love finished on the night with his minute’s restriction, Kyrie Irving and Iman Shumpert would leave the game with minor injuries in the fourth and would not return. The casual onlooker would not have even noticed, as we saw James go nuts, putting up 17 of Cleveland’s 24 points en route to a Wine and Gold winner. MVP award or not, LeBron James is the best basketball player on the face of the Earth today and continues to let his rings do the talking.